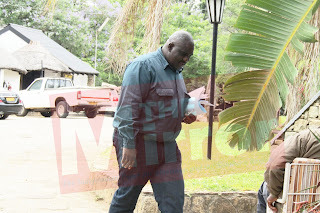 GREAT ZIMBABWE HOTEL – The Commission of Inquiry into the matter of sale of State land in and around urban areas since 2005 has ordered Vashandi Housing Co-operative, one of the biggest housing groups in Masvingo to submit all its bank and financial statements after suspecting a lot of looting of State land and members’ contributions. Two key figures in the 850-member co-operative are Chivi Central MP Ephraim Gwanongodza (treasurer) and Goddard Dunira (chairman) who is a nephew to the former Governor for Masvingo State Minister Josiah Dunira Hungwe. The commissioners expressed shock at the number of commercial properties owned, built and run by the two men in Victoria Range and called for an audit. They were also baffled by the flashy lifestyles of Gwanongodza who was just a salaries clerk at Masvingo City Council until 2013 and his colleague Dunira who was a rural school teacher. The Commission which is chaired by Justice Tendai Uchena expressed shock at the state of affairs at the housing co-operative whose constitution they described as defective during the Commission’s court hearing at the Great Zimbabwe Hotel last week. The Commissioners concluded that it was not clear whether Vashandi was a co-operative or a private company and advised that the document be revisited. The situation is made worse by the fact that Vashandi is interlinked with Rajivic, a private property development company in which Gwanongodza and Dunira are both directors and shareholders. Commissioner Mutami noted that Gwanongodza and Dunira applied for stands from the Ministry of Local Governance Development and National Housing using Vashandi Co-operative but the two transferred these stands to their private company Rajivic once the application was approved. The stands have since become private property developed and sold by Gwanongodza and Dunira for personal gain. Commissioner Heather Chingomo said this was a serious case of fraud. The Commission did a lifestyle check on Gwanongodza and Dunira and were convinced that they owned almost all commercial properties in Victoria Range although the two initially refuted the allegations. Gwanongodza was asked the number of stands that he owned in Vic Range and he initially said that he just had one residential stand which he had since sold after building a 2-roomed house on it. He said he sold the house for $12 000 but could not remember the size of the stand. Commissioner Muchena then told him that he had committed a crime by selling the stand because he had no title deeds to it and therefore all stands in Victoria Range are still State property. “You sold State land; did you get permission from the State to do so because it is the State that owns that stand?” asked Commissioner Muchena. Gwanongodza said he was ignorant of the law. He was then asked how many stands he owned and said there was nothing further to that. Commissioner Chakaipa then asked him if he knew the owner of a night club in Lot A Victoria Ranch and the MP became jittery before he agreed that he was the owner. Commissioner Heather Chingono who is a law lecturer at the University of Zimbabwe then took over and asked Gwanongodza to tell the Commission the exact number of stands that he owned. It then emerged that he was probably an owner of eight institutional stands in Lot A Victoria Ranch. The commission said Gwanongodza has since built two private schools, a hall on a place where a church was supposed to be built, a beerhall, a hardware and a number of shops in Lot A Victoria Ranch. Commissioner Heather noted that three of the stands were allocated to Gwanongodza when he was still a council employee and the rest he got when he became a Member of Parliament. She told Gwanongodza that apart from corruption there was conflict of interest for him to get so many stands when he was a council employee and there was also conflict of interest when he got stands several other stands as an MP. Dunira said he saw no conflict of interest and said he was only using openings coming from God. “Kana Mwari wako akakutendera umwe unenge uchingori mukana. Sometimes it is only an opening from God,” said Gwanongodza. He also said that some of the properties like the hall were not his but were built by the co-operative. Cornered further, Gwanongodza blamed the situation on the environment that prevailed then. He said that he was doing the project for Zanu PF with the blessing of Hungwe. Commissioner Uchena then told Gwanongodza that there was no reason for greediness even in the party. Commissioner Chingono was more blunt as she told Gwanongodza his deals were corrupt and he was looting State resources. “You looted State resources Mr Gwanongodza. You corruptly acquired institutional land both as a council employee and as an MP. “May I put it to you that it is in your inherent character and personality to loot. You take advantage of your positions. The short and long of it MP Hwanongodza is that you are benefitting,” said Commissioner Chingono. She then ordered Gwanongodza to bring all documents including offer letters and financial records for the buildings whose ownership he refused.